Only Bangladesh educated candidates can apply for this posts. Applicant should have qualification B.Sc. in Electrical Engineering/ B.Sc. in Textile Technology/ B.Sc. in Textile Engineering/ MBA in Marketing. Applicant must be minimum 5-12 years working experience with related field. The last date of application is February 09, 2017. 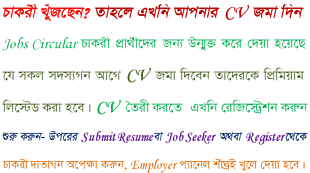 Educated and interested candidates can apply for this post with their complete CV with passport size photographs and contact phone number to the following address: Executive Director- HR & Administration, PHP family, PHP Center, 40/1, Jakir Hossain Road, Khulshi, Chittagong.